There is nothing like a boozy Sunday champagne brunch where the food also takes centre stage. Sunday Brunch at Raffles Hotel's Bar & Billiard Room has one of the most extensive, expansive and good- quality buffet spreads in town. My family and I had a superb celebratory brunch there two weeks ago. The spread is so overwhelming that you will be gasping in delight constantly, so be sure to take a good look around before you dive in. Indulge in oysters from around the world, a good selection of cold cuts, salads and antipasti. From the live stations, have your fill of full-flavoured wagyu prime rib, tender Iberico pork ribs, Welsh lamb cutlets and scrambled eggs with sea urchin. The dessert and cheese selection is divine. You must leave room for this. The hotel serves Billecart-Salmon Brut Reserve and Rose champagnes. WHERE: Bar & Billiard Room, Raffles Hotel Singapore, 1 Beach Road MRT: City Hall WHEN: Noon to 3pm, Sunday PRICE: $218++ a person, with rose; $198++ a person, with champagne; $158++ a person, with wine, beer, cocktails and juice; $98++ for children aged six to 12 TEL: 6412-1816 INFO: Go to www.raffles.com/singapore or e-mail dining.singapore@raffles.com. Booking is required. Dassai is a range of top quality sake by Asahi Shuzo, a sake brewery in Japan's Yamaguchi Prefecture. A sake bar on the fourth floor of Wisma Atria facing Food Republic may not be the most attractive of locations, but do not let that turn you off from heading to Dassai sake's pop-up bar at the newly opened Japan Food Town. 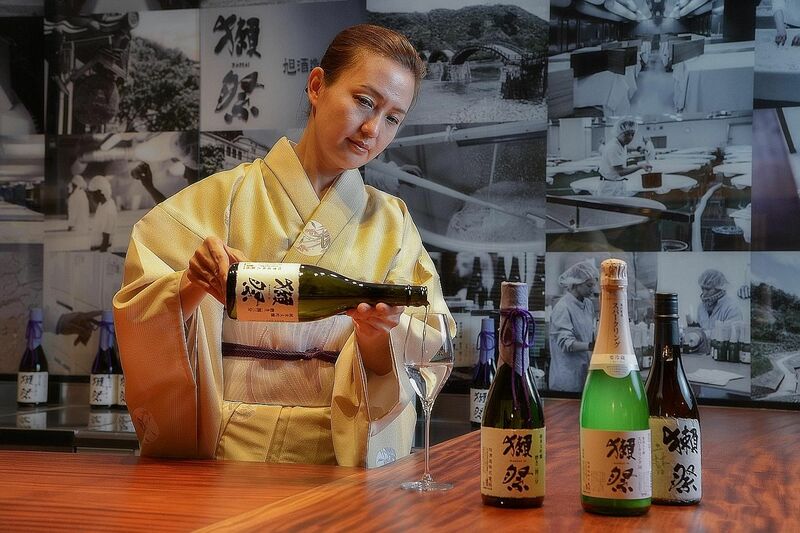 The pop-up bar is open for just six months and is the first Dassai sake bar outside of Japan. New to sake? Opt for a tasting flight. Prices range from $15 to $60. I like the unfiltered Dassai 50 Sparkling Nigori sake ($54 for half bottle). The bubbly sake is full-bodied and easy on the palate, with a good balance of acidity and sweetness. A tendon bowl from Kohaku. The bowl comes with two prawns, a piece of chicken breast, baby corn, squid, pumpkin, shiitake mushroom and French beans. I find it almost impossible to restrain myself when it comes to fried food. 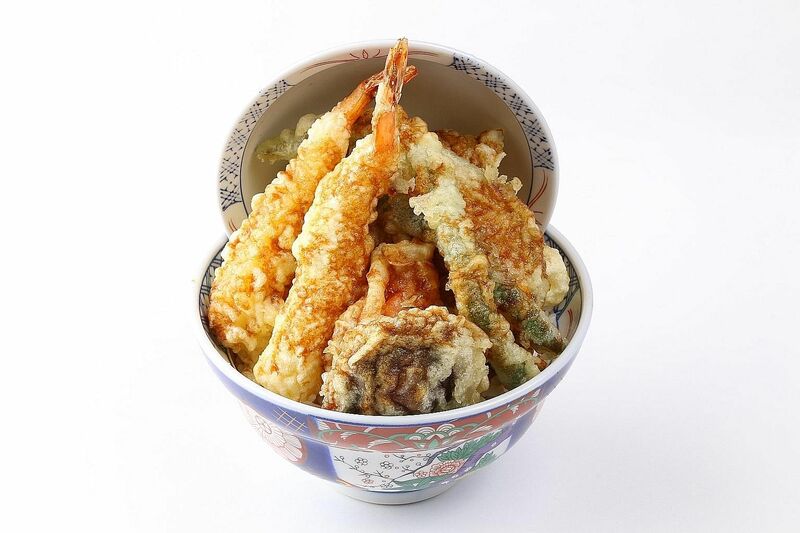 I can never say no to tendon - crisp tempura battered ingredients atop a bed of rice, drizzled with sticky sweet sauce. There is a new tendon shop called Kohaku at Suntec City's Eat At Seven, a food arena made up of individual Japanese and Korean restaurants. It is worth a try if you are in the area. A tendon bowl costs $15++ and comes with two prawns, a piece of chicken breast, baby corn, squid, pumpkin, shiitake mushroom and French beans. The Hokkaido Nanatsuboshi rice that is used here is fragrant and has a subtle sweetness. For tendon with a twist, opt for the spicy version. The spicy tendon sauce has some serious kick and flavour to it, and is better than the original version, if you ask me. A new bakery caught my attention at Ghim Moh recently. It has an unconventional name: V. Bread Fresh. And no, this is not a typo. 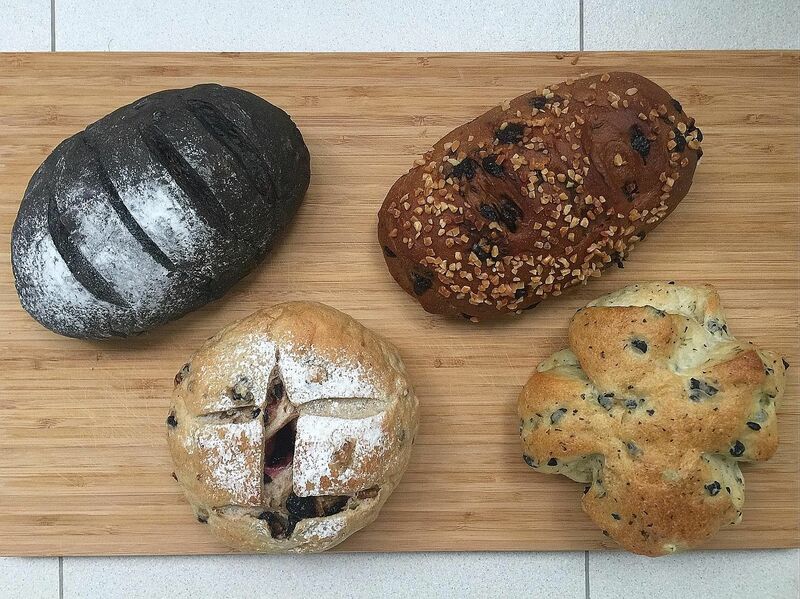 I was surprised to find an array of artisanal breads alongside the usual soft buns one would expect at an HDB bakery. Think hearty olive bread, bread with cranberries and walnuts, charcoal bread with dark chocolate, as well as multi-grain and buttery brioche-style loaves. These are priced at about $4 each. The breads, which are made with natural yeast, are fresh and have a lovely, more complex flavour than supermarket versions.